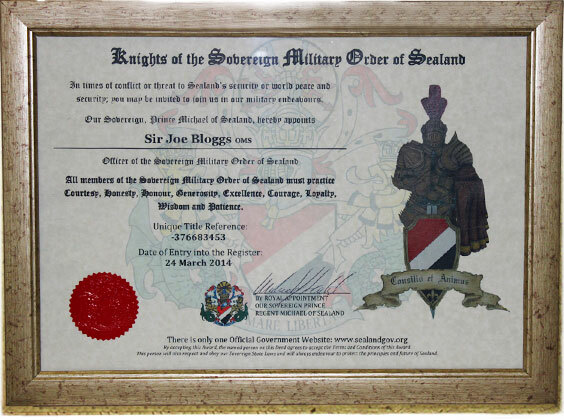 The Knights of the Sovereign Military Order of Sealand was established to defend the Principality should it come under threat or attack. 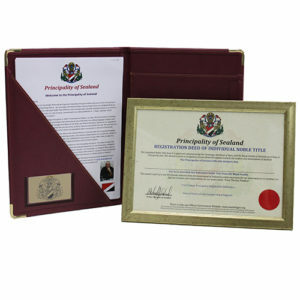 It was originally formed by Prince Roy and Prince Michael of Sealand after the invasion of 1978. The Order was made up of a group of select individuals that could be called upon to defend our sovereign nation should such a situation arise again. 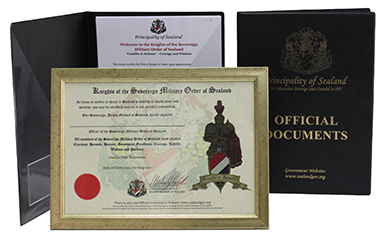 With the passing of Prince Roy in October 2012 we have decided to open the Order to members of the Public. 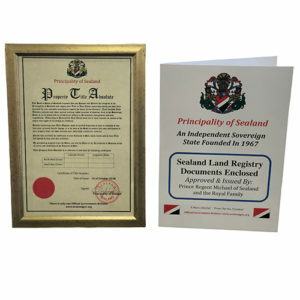 We aim to bring together supporters of the Principality of Sealand with a common goal of defending the Principality and raising the quality of life of others throughout the world. All prices are in GBP (£), however they will be converted to your local currency after you proceed to the checkout. 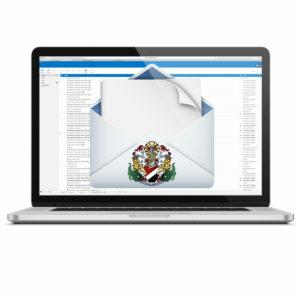 PLEASE READ: (Please check your Junk folder for follow up emails after you order your title) If you forget to insert your name for a Title Pack we will send you a registration email requesting your details. Received the knightly papers today and I am thrilled by them. They do look not just official but also genuine and purposeful. 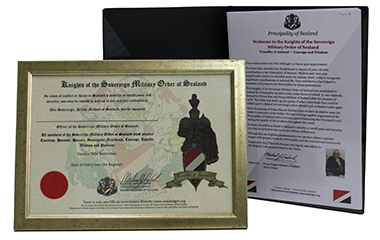 The values and code of conduct you agreed to being a knight of the Order can make one’s life meaningful as it not just affects the Prinicipality of Sealand but the entire world when adhering to that pledge. 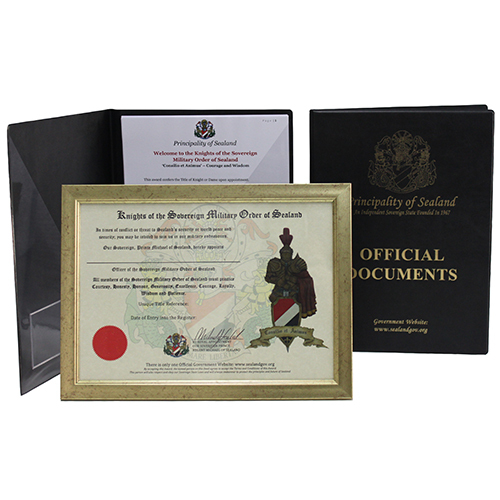 Having received my official knightly papers today, I was very impressed by the presentation of the documents enclosed, not to mention the speedy arrival of the package in question. 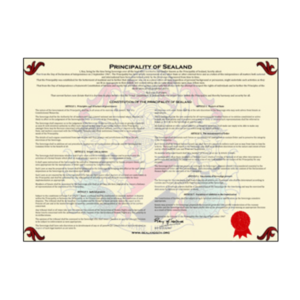 I cannot say I am surprised, however, seeing that the Principality of Sealand has not been known to do anything by halves. True, these papers have been designed to a very high standard, but in order for them to have true meaning, I must be true to the code of chivalry and the plight of my fellow man. Blessings be upon Prince Michael, I feel honoured to take up the mantle of Knight and, change the world for the better. Consilio et Animus! Excelsior!